Objective To identify simplified selection criteria for mechanical thrombectomy (MT) in longer and unknown time windows. Methods Patients with large vessel occlusion (LVO) in the anterior circulation who underwent MT between January 2014 and November 2017 were identified from the local registry. Patients were selected for analysis if they met the current guideline recommendation for MT treatment except for time window (HERMES-like) and were divided according to time they were last seen well (LSW): LSW <6 hours or LSW >6 hours before MT. The primary endpoint, good outcome, was modified Rankin scale score 0–2 on day 90. Safety outcomes were mortality on day 90 and symptomatic intracranial hemorrhage (sICH). Univariate and multivariate analysis were performed for good outcome in HERMES-like patients. Results In total, 752 patients were identified and 390 patients (51.9%) fulfilled the HERMES-like criteria. Despite differences in baseline parameters, more diffusion-weighted imaging (DWI) (43.9% vs 11.3%, p<0.001) and fewer cases of thrombolysis (32.7% vs 77%, p<0.001), patients LSW >6 hours (n=107) did not differ in the primary and secondary endpoints: good outcome (44.9% vs 44.9%, p=1.0), mortality (14% vs 15.2%, p=0.87), and sICH (5.6% vs 6%, p=1.0). After multivariate regression analysis, independent predictors of good outcome remained: age, OR=0.96 (95% CI 0.95 to 0.98); National Institutes of Health Stroke Scale score, OR=0.92 (95% CI 0.89 to 0.96); Alberta Stroke Programme Early CT Score (ASPECTS), OR=1.26 (95% CI 1.06 to 1.49); general anesthesia, OR=0.2 (95% CI 0.04 to 0.99), and successful recanalization, OR=12 (95% CI 4.7 to 30.5); but not treatment time and DWI or CT perfusion at baseline. Conclusion Patients with proven LVO in unknown and longer time windows may be selected for MT based on ASPECTS and clinical criteria. Evidence for the efficacy and safety of mechanical thrombectomy (MT) in patients with large vessel occlusion (LVO) of the anterior circulation is overwhelming. 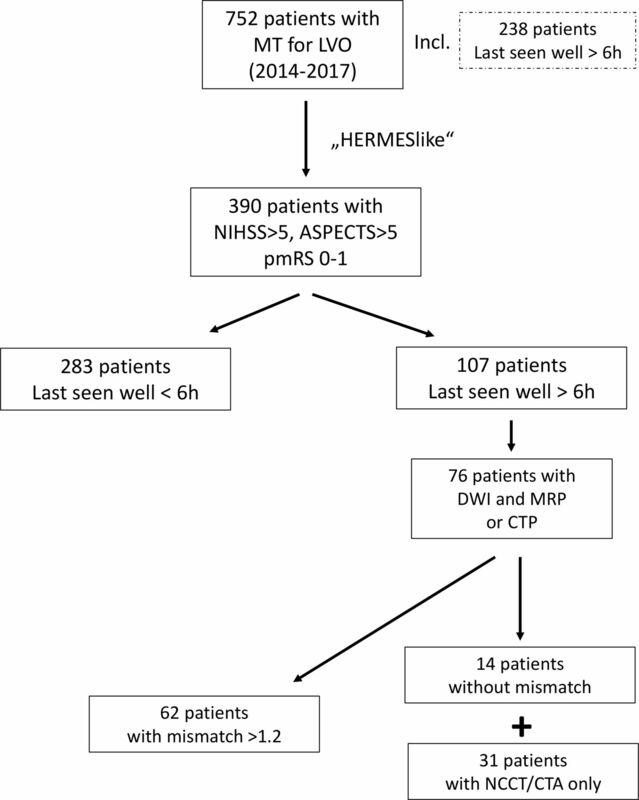 The HERMES (Highly Effective Reperfusion evaluated in Multiple Endovascular Stroke trials) collaborators performed two meta-analyses of five randomized trials, which showed that the proportion of patients who achieved a good outcome as defined by 0 to 2 points on the modified Rankin scale (mRS) was 46% after 90 days, and the odds of better disability outcomes at 90 days with the endovascular group retained statistically significant through 7 hours and 18 min.1 2 Recently, the DAWN (Clinical Mismatch in the Triage of Wake Up and Late Presenting Strokes Undergoing Neurointervention With Trevo) trial and the DEFUSE 3 (Endovascular Therapy Following Imaging Evaluation for Ischemic Stroke 3) also provided evidence that MT is effective and safe, as compared with best medical treatment, in patients who were last seen well from 6 and up to 24 hours before treatment.3 4 However, inclusion in both trials was based on automated estimation of infarct core (and mismatch) by either CT perfusion (CTP) or diffusion-weighted MR imaging (DWI). The most recent guidelines now recommend applying the DAWN and DEFUSE 3 imaging criteria (perfusion imaging-based) to select patients in unknown and longer time windows.5 We aimed to test in a large monocentric and prospectively collected cohort whether patients with LVO may be successfully selected for MT based on the Alberta Stroke Programme Early CT Score (ASPECTS) and clinical criteria only, irrespective of time. We searched our prospective database, the Heidelberg Recanalization Registry (HeiReKa), for patients with ischemic strokes due to LVO in the anterior circulation who had received MT up to 24 hours or unknown time from onset between 2014 and November 2017 (4 years). During this time our local imaging protocol requirements and treatment recommendations varied but included at least a non-contrast-enhanced CT (NCCT) scan and a CT angiogram for baseline imaging (online supplementary material). CTP and magnet resonance perfusion parameters included time to peak, cerebral blood volume, and cerebral blood flow and were calculated using the software provided by the manufacturer of the CT and MR apparatus (Siemens, Erlangen, Germany). Mismatch on perfusion imaging between time to peak and cerebral blood volume maps or DWI was only semiquantitatively assessed and defined as described in the European Cooperative Acute Stroke Study (ECASS) IV trial protocol: penumbral imaging with a perfusion volume (PWI) to infarct core (DWI) ratio of 1.2, and a perfusion lesion minimum volume of 20 mL.6 7 Treatment decisions were made by the local team (stroke physician and neuroradiologist on call), but generally MT was recommended according to our local standard operating procedures following national and international guidelines (online supplementary material). Between April 2014 and February 2016 eligible patients were included in our single-center randomized sedation trial SIESTA8 comparing general anesthesia with conscious sedation; thereafter, the primary mode of sedation was conscious sedation. Recanalization was assessed using the Thrombolysis in Cerebral Infarction scale by an experienced neuroradiologist, and successful recanalization was defined as ≥2b. The ASPECTS score was calculated by e-ASPECTS (www.brainomix.com) on baseline CT. e-ASPECTS has been being used as a research tool since 2014 and since 2015 as a decision support tool in routine clinical practice in our institution. In both cases, the e-ASPECTS results were available to the treating physician. The non-inferior performance of e-ASPECTS for neuroradiologists as well as its clinical utility has been described previously.9 10 If MRI was performed, ASPECTS was determined by two investigators (SN and JARP), who in ‘HERMES-like’ patients beyond 6 hours also reviewed all CTP and MRI images for the presence of mismatch as defined above. The outcome was measured with the mRS after 90 days and obtained through rehabilitation reports, outpatient assessments, or a standardized interview by an unblinded investigator. The primary endpoint ‘good clinical outcome’ was defined as mRS score 0–2. Safety endpoints were mortality after 90 days and symptomatic intracranial hemorrhage (sICH) defined according to ECASS II.11 As recommended in the guidelines, patients were included in the analysis if they met the following criteria for patient selection within 6 hours from onset5 and labeled as ‘HERMES-like’: (i) premorbid mRS 0–1, (ii) ASPECTS ≥6 (either on CT or DWI), and (iii) National Institutes of Health Stroke Scale (NIHSS) score ≥6. Patients who underwent MT twice within the period were excluded. Patients were then divided into two groups according to the time last seen well (LSW): LSW <6 hours—that is, within 6 hours, and LSW >6 hours—that is, beyond 6 hours, before initiating MT. Nominal variables are described as frequencies, ordinal variables as median (IQR), and continuous variables as mean±SD. Differences between groups were assessed with Fisher’s exact test, χ2 test, Mann-Whitney test, or t test as appropriate, and a p value of 0.05 was considered statistically significant. Univariate and multivariate analyses for the primary endpoint ‘good outcome’ were performed. All variables with p<0.05 in the univariate analysis were included in a forward stepwise logistic regression model. Odds ratios (ORs) are described with 95% confidence intervals. HeiReKa and analyses within were approved by the ethics committee of Heidelberg University (S-325/2015). Owing to the monocentric and retrospective nature of the study, informed consent of the patients was waived. In total, 752 patients received an MT for LVO in the anterior circulation within 24 hours after last being seen well in the given time frame. Three hundred and ninety patients (51.9%) fulfilled the HERMES-like guidelines criteria and were compared according to treatment time (figure 1/table 1). Data for the excluded patients (n=362, 48.1%) are shown in the online supplementary material. Interestingly, patients did not differ in the primary and secondary endpoints: good outcome was reached in 44.9%, irrespective of time to treatment (figure 2), and sICH was also low and comparable in the two groups (6% vs 5.6%, p=1.0). Patients in the LSW >6 hours group, however, differed in important baseline, imaging, and treatment variables, such as gender, wake-up stroke, occlusion type, imaging modality, including perfusion imaging, and ASPECTS (table 1). They were also less often treated with IV thrombolysis and by definition had much longer onset to treatment times than those patients with witnessed onset; rates of successful recanalization were similarly high in the two groups (table 1). In patients with longer time windows (LSW >6 hours) examined with MRI or CTP, mismatch was present in 81.6% (62/76); in 18.4% (14/76) mismatch was smaller than 20% or the perfusion imaging could not be analyzed (for technical reasons). 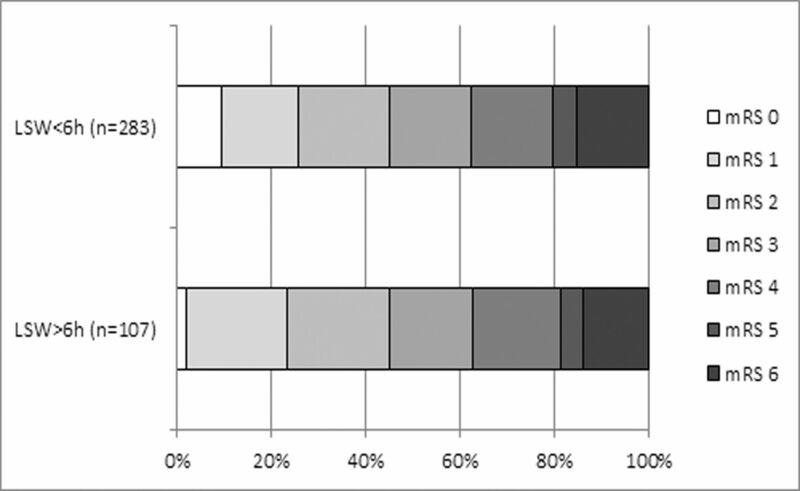 Comparing the primary endpoint good outcome in HERMES-like and LSW >6 hours patients with mismatch (62/107) with those without mismatch or core imaging only (45/107), we still found no relevant difference (46.8% vs 42.9%, p=0.69). Flowchart of patients. ASPECTS, Alberta Stroke Programme Early CT Score; CTA, CT angiography; CTP, CT perfusion; DWI, diffusion-weighted imaging; LVO, large vessel occlusion; MRP, magnetic resonance perfusion; MT, mechanical thrombectomy; NCCT, non-contrast-enhanced CT; NIHSS, National Institute of Health Stroke Scale; pmRS, premorbid modified Rankin Scale. Clinical outcome after 90 days on the modified Rankin Scale (mRS) in HERMES-like patients (n=390). LSW, last seen well. The only factors that were significantly associated with good outcome in univariate analysis were premorbid disability (mRS 1), age, NIHSS, and ASPECTS at baseline, general anesthesia, and recanalization (table 2), but not the application of MR or CT perfusion imaging. After multivariate regression analysis, independent predictors of good outcome remained: younger age OR=0.96 per year (95% CI 0.95 to 0.98), lower NIHSS per point OR=0.92 (95% CI 0.88 to 0.96), higher ASPECTS per point OR=1.25 (95% CI 1.06 to 1.49), avoiding general anesthesia OR=0.2 (95% CI 0.04 to 0.99), and successful recanalization OR=12 (95% CI 4.7 to 30.5). Our study, which to the best of our knowledge was performed in the largest non-randomized cohort of patients in routine clinical practice undergoing MT for LVO in the anterior circulation in unknown or longer time windows (n=238 in total), found no difference in outcome compared with those patients treated within 6 hours after last having been seen well. In HERMES-like patients (n=390)—that is, those fulfilling the current guideline criteria for treatment within 6 hours, rates of good outcome were 44.9% in patients LSW <6 hours and LSW >6 hours, being comparable to the HERMES meta-analysis1 and both DAWN and DEFUSE 3.3 4 Both safety endpoints, mortality and sICH, were also similar and low in both groups. Importantly, the performance of MRI or CTP at baseline was not associated with outcome in our HERMES-like cohort, and the clinical outcome of patients with MRI and CTP and present mismatch was also similar to those without mismatch, or core imaging only (CT or DWI). The only independent predictors of good outcome were younger age, lower NIHSS, higher ASPECTS, conscious sedation, and successful recanalization. The DAWN and DEFUSE 3 trials made an invaluable contribution to the field and trial inclusion was based on automated assessment by the RAPID software (www.ischemaview.com) of CT perfusion or DWI (which are not readily available in most, even comprehensive, stroke centers) highlighting a small infarct core. Of note, patients in DAWN were also required to have less than one-third infarction of the territory of the middle cerebral artery on NCCT and patients in DEFUSE 3 had to have an ASPECTS of ≥6 at baseline imaging.3 4 Most interestingly, the rate of good outcome in the control groups of both DAWN and DEFUSE 3 was very low (15%) , probably due to less use of recombinant tissue plasminogen activator and less frequent spontaneous recanalization . Such a poor outcome rate in the control groups means that even a small treatment effect through performance of MT will become meaningful. The other independent predictors of outcome such as age, NIHSS, and recanalization are well established and not surprising, highlighting the reproducibility of our results. The effect of general anesthesia on outcome, however, should be interpreted with caution since after completion of the SIESTA trial only very severely affected or agitated patients were treated under this mode of sedation in our department, thereby potentially biasing the results. This study has some limitations; first, it is monocentric and retrospective and hence the comparative groups are misbalanced in some baseline variables, but data collection is prospective in HeiReKa and our results are comparable to those of recent randomized controlled trials and other large registries. HeiReKa does not contain data on patients who did not receive acute recanalization therapy; thus, we cannot report imaging profiles of patients who were evaluated for MT but thereafter did not receive treatment. Our supplementary analysis, however, shows that even in patients who received MT outside the current guideline (ie, despite lower ASPECTS and higher prestroke disability), treatment time was not a treatment effect modifier. Furthermore, MR and CT perfusion were only semiquantitatively assessed and not using automated software (which was done in DAWN and DEFUSE 3); however, the use of MRI and perfusion imaging showed no association with outcome. In this large cohort of patients we demonstrate the utility of simple clinical (good baseline function, significant neurologic deficit) and imaging (high ASPECTS and CT angiography confirmation of large vessel occlusion) criteria in treatment selection for MT in late and unknown treatment time windows. Applying these criteria produced clinical outcomes and safety profiles equivalent to those of the cohort of patients undergoing early-window MT and to historical data from randomized controlled trials. No added usefulness was provided by perfusion imaging in this dataset. Further studies examining the role of perfusion in the more marginal cases (ie, non-HERMES-like) are warranted. We view these data as encouraging as we are attempting to expand the pool of candidates for late-window treatment and simplify the processes by which these patients are selected. These data also support the impression that real-world practice of MT may not necessarily need to mimic clinical trial design and execution to be reasonable. SN and CH contributed equally. Contributors All authors contributed substantially to the conception or design of the work; or the acquisition, analysis, or interpretation of data for the work AND in drafting the work or revising it critically for important intellectual content AND gave their final approval of the version to be published. All authors agreed to be accountable for all aspects of the work in ensuring that questions related to the accuracy or integrity of any part of the work are appropriately investigated and resolved. Competing interests Outside the published work, personal fees, travel support, speaker honoraria, or research grants were received from Acandis (MAM), Bayer (MB, PAR, SN), Brainomix (SN, CH), BMS Pfizer (MB, PAR, SN), Boehringer Ingelheim (MB, PAR, SN), Codman (MB, MAM), Medtronic (MAM, SN, MB), Deutsche Forschungsgesellschaft (MB, PAR), Guerbet (MB), Hopp foundation (MB), Microvention (MAM), Phenox (MAM), Roche (MB), Siemens (MB, JARP) and Stryker (CH, JARP, MAM), TEVA (MB), Vascular Dynamics (MB). Ethics approval Heidelberg ethics committee.